The Association of American Publishers (AAP) has just debuted a new annual estimate of the US book market. StatShot Annual (not to be confused with the monthly StatShot report or the now retired BookStats program) is based on the reported annual revenues of some 1,800 US publishers. It shows that the total US book market (including trade and other segments) amounted to just shy of $28 billion in 2014, with 2.7 billion units sold. Edit: Just to be clear, all the figures in this post represent industry revenue, and not consumer sales. But this being an ebook blog, we're not interested in the overall market so much as the ebook and audiobook markets. Downloadable audiobooks are still a small segment in absolute terms (48 million units) but it is growing at a fast clip. 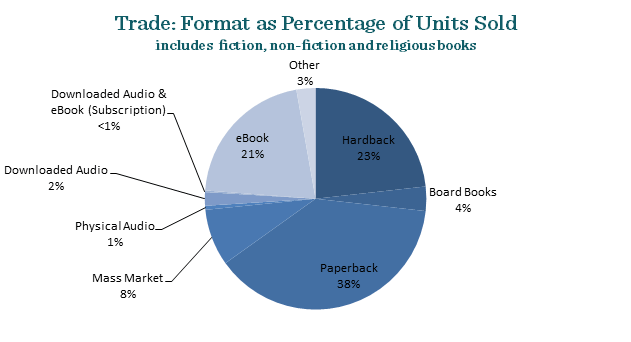 The segment saw record growth in both units (27.0%) and revenue (26.8%) over 2013, while physical audiobooks slightly declined. As for ebooks, the monthly Statshot report from December 2014 already told us that the market was up slightly, and today the AAP tells us that the total market grew by 3.8% to an estimated $3.37 billion dollars, with 510 million ebook units sold (up 0.2%). As I pointed out this morning, that is more than twice the ebook unit volume Nielsen reported for 2014. That’s almost as large of a volume as the number of hardbacks sold in 2014 (568 million), and best of all it doesn't include the ebooks subscription estimates. For the first time ever, the AAP is tracking ebook and audiobook subscription services. They estimate that 2.47 million and 3.88 million audiobooks were loaned in 2014. There are no figures for 2013, but that is not a serious issue as any figure would be incredibly small. The US ebook subscription market only really got started very late in 2013, and KU of course did not launch until July 2014. All of the above data is based on the press release sent by the AAP on Wednesday. You can find a copy of that release over on DBW. But before I go, here's one final note. The AAP also estimates that brick-and-mortar stores saw a resurgence in 2014. Books sold by physical retail stores saw an increase of 3.2% in revenue ($3.80 billion from $3.68 billion) and 4.1% in units (577 million from 554 million) in the trade category. More books were still sold online (832 million units in volume and $5.90 billion in revenue) but the increase in offline sales lends credence to the reports of the revival of US bookstores.